TORONTO, ON. April 3, 2017 – Lexus International today announced the Grand Prix winner of the Lexus Design Award 2017 – PIXEL by Hiroto Yoshizoe – leading this prestigious international event to a peak of excitement. Lexus Design Award 2017 drew 1,152 entries from 63 countries under the theme of YET. “The Lexus Design Award always presents a fascinating survey of the issues currently engaging young designers, and what they consider to be the most important challenges and compelling opportunities for design today. 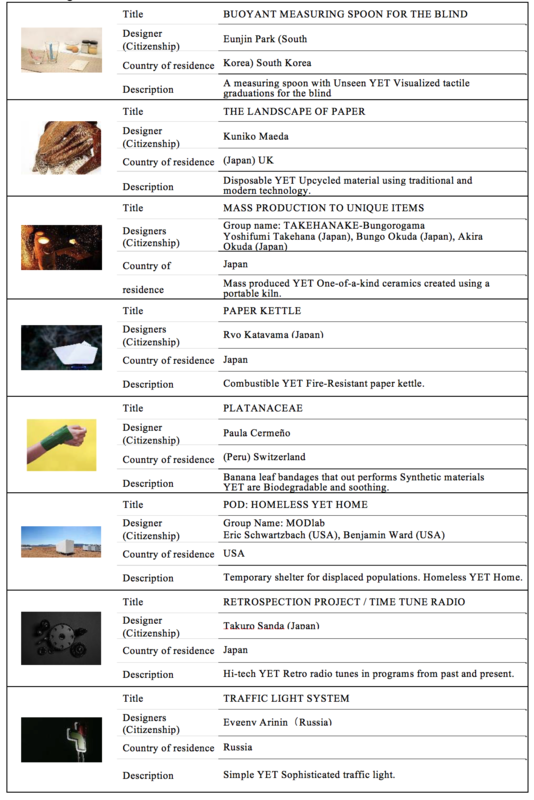 However, the quality and scale of ambition of the submissions to this year's award program was truly exceptional. It was very difficult for us to whittle them all down to twelve finalists, then four prototype winners and finally to the Grand Prix winner, although every stage of the process generated a feisty and enjoyable debate. 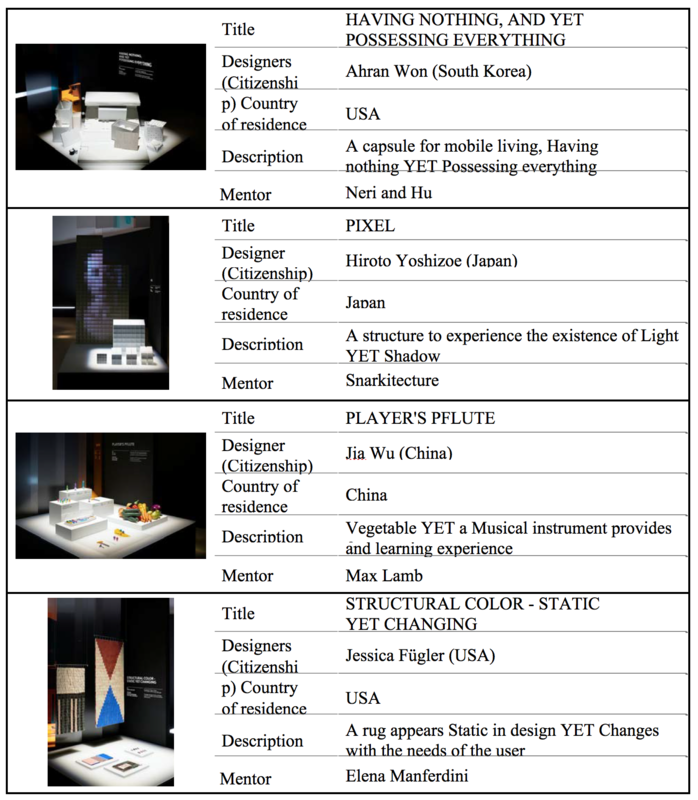 Each of the four prototype winners has wrestled with complex and significant issues, from the plight of refugees and other homeless people and providing environmental protection for buildings in a beguiling and poetic way, to fusing traditional craftsmanship with emerging technologies and encouraging children to make and play musical instruments. Eclectic and original though their responses are, all the finalists have addressed the defining theme of the Lexus Design Award 2017, YET, with tremendous imagination, versatility and aplomb.” said Alice Rawsthorn, Lexus Design Award 2017 judge and a design commentator. First launched in 2013 to stimulate ideas for a better tomorrow, Lexus is celebrating the 5th anniversary of this international design competition which supports up-and-coming designers and creators worldwide. The Grand Prix winner was chosen by an elite global creative design panel after presentations by the four prototype finalists. The works of all 12 finalists -- four prototype winners and eight panel winners -- are on display at the LEXUS YET pavilion, revealing how they would apply the ‘YET’ philosophy in original and innovative ways. LEXUS YET will be held April 4th through April 9th at the La Triennale di Milano, the Design and Art Museum in Parco Sempione, Milan, central to Milan Design Week, the world’s largest design exhibition, also known as Salone Del Mobile. This event marks the tenth edition for Lexus International at Milan Design Week, highlighting the brand’s long standing passion for design and innovation. To celebrate this significant juncture, Lexus enlisted the cooperation of Architect, Designer and Professor Neri Oxman of the MIT Media Lab and her research and design team, The Mediated Matter Group. An acclaimed creative pioneer operating at the leading edge of architecture and design, Oxman is known for design innovation that is inspired and informed by the natural world. Oxman’s vision of harmonizing “nature” and its seeming opposite “technology” resonates strongly with the Lexus ‘YET’ philosophy*. In addition to the Lexus Design Award 2017 display, the LEXUS YET exhibition is composed of three following areas where visitors will experience the exciting and infinite potential of YET through immersive and engaging installations. Created by Neri Oxman and The Mediated Matter Group, MIT Media Lab. Inspired by Lexus’ ‘YET’ philosophy and created for the opening space, this installation aims to create the experience of being grounded YET suspended by light – a wave YET a particle. Utilizing an ancient material YET a modern technology, The Mediated Matter Group debuts Glass 3D Printing at architectural scales. By exploring things from many angles, we are able to see beyond the obvious and discover the new and unexpected. This Static YET Dynamic installation reveals the Lexus UX Concept car, and expresses Lexus Brave Design. The Lexus’ UX Concept car embodies our ‘YET’ philosophy. This expression of a progressive and strong YET artistic and premium product further enhances Lexus' unique brand position which challenges conventional ideas about luxury. This event marks Lexus’ 10th edition at Milan Design Week, highlighting the brand’s long standing passion for design and innovation. As we celebrate this opportunity, we take a look back at our 9 years of design inspiration. Each edition highlights one moment in time through 24 frames. * The ‘YET’ philosophy drives Lexus to push the boundaries of creativity by fusing seemingly incompatible elements. It says “Don’t compromise; harmonize.” The resulting synergy sparks breakthroughs, while revealing possibilities beyond imagination. Yoshihiro Sawa graduated with a Bachelor of Science degree in Engineering and Design from Kyoto Institute of Technology. He has held a number of design-related positions since joining Toyota Motor Corporation in 1980, including Chief Officer of Global Design, Planning Division. He became President of Lexus International in April 2017. Fame. Neri & Hu believes strongly that research is a key design tool as each project brings its own unique set of contextual issues. Providing architecture, interior, master planning, graphic and product design services, Neri & Hu recognizes that contemporary problems relating to buildings extend beyond the boundaries of traditional architecture. Rather than starting from a formulaic design, Neri & Hu’s work is anchored in the dynamic interaction of experience, detail, material, form and light. Max Lamb’s work plays with the tradition of the working rural landscape — the beach as foundry, the quarry as workshop, felled yew trees of the Chatsworth estate as subject and source material. He is equally fascinated by the city, and his ability to adapt and respond to different environments produces designs that are uniquely of their time and place. Max is not committed to a single material or process, nor is he attracted to design as a means to solve problems. Rather he exploits the qualities inherent in a material to draw out its natural tendencies and beauty. His methods are high- and low-tech, and he is both designer and manufacturer, collaborating with foundries and factories as the scale or complexity of the project necessitates. However, there is continuity in the principles that he applies — honesty to material, a celebration of the process and of human capability, and its limitations. 2011 she received a prestigious annual grant from United States Artists (USA) and her Blossom design for Alessi received the Good Design Award. environment. Transforming the familiar into the extraordinary, Snarkitecture makes architecture perform the unexpected. First launched in 2013, the Lexus Design Award is an international design competition that targets up-and-coming creators from around the world. The award seeks to foster the growth of ideas that contribute to society by supporting designers and creators whose works can help to shape a better future. This provides a unique opportunity for four finalists to work with globally recognized designer as a mentor to create prototypes of their designs, and then exhibit them at one of the design calendar's most important events.